Mercedes-Benz E-Class Coupé Performance, Engine, Ride, Handling | What Car? The biggest-selling engine is likely to be the E220d diesel, which feels nicely suited to the E-Class Coupé. Okay, so it isn’t the most powerful engine available, but it never feels out of breath and only becomes noticeably grumbly when pushed extremely hard. Kept at a cruise, diesel noise fades into the background. If you like diesel economy but value refinement and want something a little swifter, the E350d is worth considering. It’s the second-quickest E-Class Coupé that’s currently available, yet it’s still capable of more than 40mpg in official testing. It’s also more hushed than the 2.0-litre diesel, if not quite as subdued as an equivalent oil-burning V6 from Audi. With more power than the E220d but less low-down pull, the four-cylinder E300 petrol needs to be worked harder than the entry-level diesel to make the same progress. Keep the revs high and it will outsprint the E220d from standstill to motorway speeds and is less than half a second slower to reach 62mph from standstill compared with the E350d. It’s not the smoothest petrol engine, though, and doesn’t sound overtly sporty. The E400 petrol gets six cylinders, so it’s inherently more powerful. The 0-62mph sprint takes only 5.3sec and, with four-wheel drive as standard, it gets off the line quickly almost regardless of the weather. But, more importantly than outright speed, it feels suitably punchy throughout the rev range, making the E400 a very easy-going car to cover long distances in. The problem is that extra ability comes with a considerable hike in the price tag and running costs. All these engines come with a nine-speed automatic gearbox that does a fine job of distributing power intelligently when left to its own devices and will respond quickly to manual input at the paddles. Two suspension types are available: steel springs with adaptive dampers, which come as standard, or an optional air suspension that can be stiffened and softened. 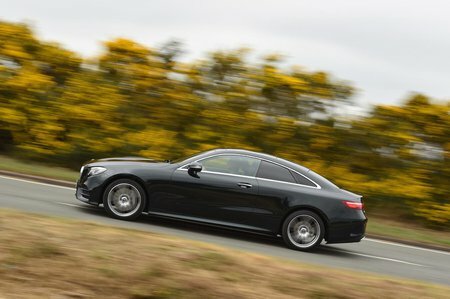 Mercedes’ air suspension does a very good job of soaking up road imperfections at high speeds, although the occasional sharp-edged pothole or particularly rough stretch of road can throw it off. The steel springs are noticeably less compliant at all speeds, with smaller undulations sending judders through the car. 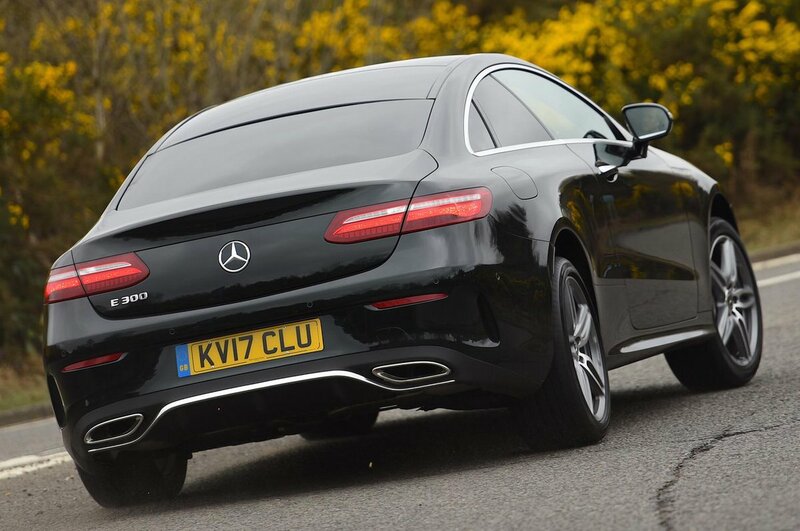 Unfortunately, the E-Class Coupé doesn’t match its good performance, quietness and comfort with agility. It rides lower to the ground than the saloon, but the coupé’s rather numb steering and body lean mean there’s little enjoyment in flinging it around tight bends. Should you push on, though, you’ll discover there’s plenty of grip and a neutral balance between the front and rear wheels. If you require even more sure-footedness, four-wheel drive is optional on the E220d and standard on V6-powered models. While it certainly gives great traction on slippery roads, it does make both emissions and economy worse on the E220d. With that in mind, we’d think carefully before ticking that option box.